Even professional contemporary-music ensembles don’t often perform six world premieres on a single night. But on Friday at National Sawdust in Brooklyn, some 90 teenagers between the ages of 14 and 18 did just that. 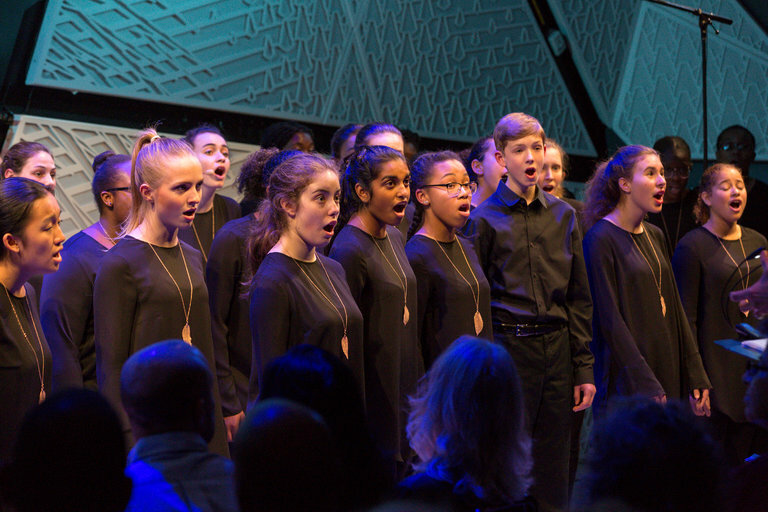 The excellent Young People’s Chorus of New York City presented the next installment of Transient Glory, its program that commissions composers to write challenging works for young voices. Francisco J. Núñez, the chorus’s visionary artistic director, inaugurated this project in 2001. Its title suggests that for a few, fleeting years the voices of well-trained young people have a special sound, a poignant innocence. These qualities came through on Friday when the dedicated members of this multiracial choir brought affecting vocal beauty and impressive skill to six demanding and strikingly different pieces. The text for the first part of Mason Bates’s “Sirens” comes from Homer’s “The Odyssey.” The composer was intrigued that the sirens of Circe, unlike other temptresses, lured sailors to their deaths through song. The music subtly threads lyrical lines through passages dominated by rippling rhythmic patterns. The complex modernist Charles Wuorinen might not have seemed a likely candidate to write a piece for teenagers. His “Exsultet” uses an ancient Easter proclamation as a text. In conceiving this intricate piece for young voices, Mr. Wuorinen didn’t make many compromises. A melismatic choral chant is buttressed by vibrant pointillist lines and runs for piano, trumpet and trombone. As cross as a bear. The engaging, breathless music mostly follows the flow of the words, though the composer takes every chance to break things up. In “A Murmuration for Chibok,” the composer Joan La Barbara, working with lyrics by Monique Truong, created a wrenching yet affirming musical portrait of the more than 250 schoolgirls who were abducted in Nigeria by the extremist group Boko Haram in 2014. (Most remain in captivity.) The choir’s treble voices executed vocal ululations evoking the chatter and laughter of these girls who bravely dared to attend classes. Michael Gordon compiled the lyrics for his “Great Trees of New York City” from information the parks department supplies about historic trees. He also used the Joyce Kilmer poem “Trees.” The beguiling yet manic music involves nearly nonstop patter, which the singers dispatched commandingly. The concert ended with “Danse Africaine” by Jessie Montgomery, a former chorus member. Her undulant, animated piece sets a text by Langston Hughes celebrating African song and dance. So far, the Young People’s Chorus has released three recordings of Transient Glory pieces. Let’s hope these new works make it to another one.